Cultural Event 1: I went to this lecture. I sat there waiting for it to start as long as I stayed. I didn't stay long. Just enough to hear Yulin Wang of Nanjing, China talk about his life and career. I think everyone thought it was pretty interesting, except his 'friend' Poul Nielen who stood behind him the whole time in an inpatient manner. Nielen's body language told the crowd he had heard enough of Wang's life. A life that seemed very interesting and relevant to any artists. Also, Nielen had an 'I'm better than you' attitude toward the crowd. Suggesting that no one but him had ever been to China by saying, 'You might have seen things similar to this on TV' several times. My advice to Wang, stop traveling with such a jerk. Cultural Event 2: I joined the Kennebec Valley Arts Association. I think that means I'm able to participate in a couple group shows a year at the KVAA's gallery, Harlow Gallery in Hallowell Maine. Cultural Event 3: After safely passing by several times I finally went into the Capital Buffet. The service was really good for a buffet, unlike any other. 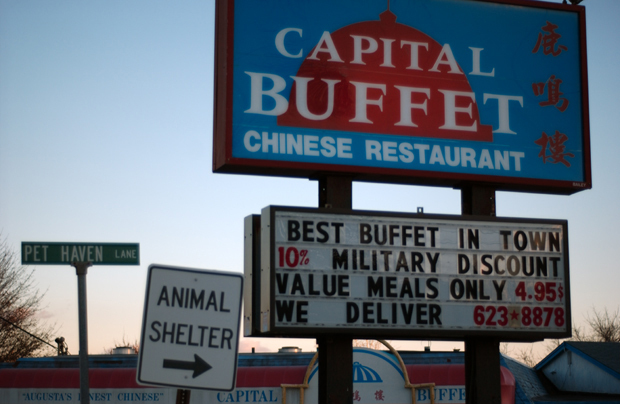 The buffet was like any other, crappy food. Cultural Event 4: VDT or Video Display Training is mandatory in the state of Maine if you spend more than 3 hours a day at a monitor. They tell you to stretch and come in and put rems of paper under your monitor to boost it up higher, they tell you how to sit in your chair, they tell your feet should be flat on the floor and where your keyboard should be placed.